We are looking forward to hosting our first annual design-build seminar series titled "Livable. Desirable. Sustainable." Throughout our many years of service, we have observed that there is a certain level of confusion and uncertainty that all homeowners face as the begin to tackle a remodeling project. With that in mind, we have crafted this seminar series to help you differentiate between what is essential and what is unimportant, between what is fact and what is fiction. You will learn strategies that will help you establish if remodeling is a cost effective solution, and, if so, how to proceed from concept to completion and beyond. When is Remodeling the Right Decision? Factors to consider as you choose whether to find a new home or expand and improve your existing space. Understanding zoning regulations, FEMA standards, architectural review requirements, and building code constraints. A proactive, user-friendly approach to healthy environments and earth friendly practices. 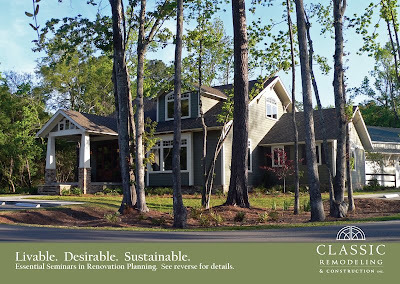 Hosted at our office (1832 River Road | Johns Island, SC 29455) and presented by our award winning design team. Call 843-763-3297 to reserve your place.